Fried chicken is one of the most iconic recipes in American cuisine. It's been served in restaurants and homes across the country since the early 1800s, though the recipe is believed to have originated in Scotland or West Africa. The dish is best known for its crispy and seasoned exterior and juicy interior, which you get from deep frying the chicken in hot oil. In this blog, we'll cover the things you should consider when choosing oil for deep frying, list the best oils for frying chicken, and give you some tips to make your fried chicken extra crispy and delicious. There are many different types of oil, each of which is good for different cooking methods, and if you choose the wrong oil for the job, it can affect the flavor and texture of your chicken. When choosing oil for deep frying, there are three main considerations you want to factor in: flavor transfer, smoke point, and the flavor of the oil. Flavor Transfer: Flavor transfer is when flavors from your fried food stay in the oil and then transfer to the next batch of food that you're frying, affecting its flavor. 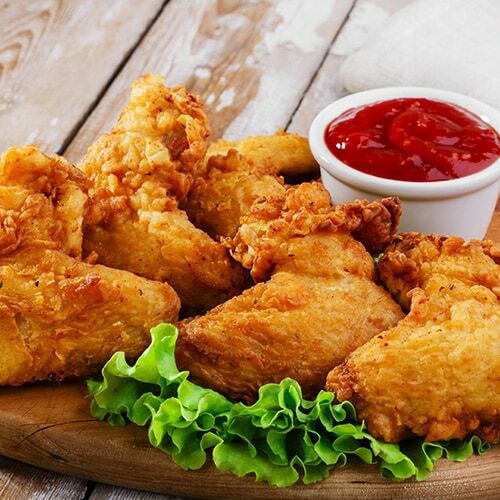 When choosing an oil for deep frying chicken, you want to choose one that prevents flavor transfer so your chicken retains its flavor and doesn't end up tasting like fried fish or mozzarella sticks. Smoke Point: When oil reaches a certain temperature, it starts to smoke and turn rancid, but this temperature ranges by the type of oil. Deep frying chicken requires a high temperature, so you want to choose an oil that has a high smoke point, so it doesn't smoke and affect the flavor of your chicken. Oil Flavor: Some types of oil have a strong flavor and using them for frying can affect how your food tastes. When frying chicken, you want the flavor of the chicken and the seasoning in the breading to come through, so you should pick oil that has a neutral taste. Whether you're frying up chicken wings at your sports bar or you're deep frying chicken breasts for your family get-together, here are the five best cooking oils for frying chicken that have high smoke points and neutral flavors. Vegetable Shortening 360 Degrees If you want to make fried chicken like your grandparents used to make, frying chicken in shortening is the best method. This solid fat melts as it heats, and is a popular substitute for oil when frying chicken in the South. Lard 370 Degrees Similar to vegetable shortening, lard is a traditional frying medium in the South. Lard is a great choice for frying chicken because it gives your chicken an excellent flavor and unparalleled crispy crust. Peanut Oil 450 Degrees Peanut oil is one of the most affordable types of oil and it has a high smoke point, making it ideal for frying chicken. Plus, peanut oil prevents flavor transfer, which is excellent for establishments serving multiple fried foods. Canola Oil 400 Degrees With a high smoke point and neutral flavor, canola oil is excellent for frying chicken. As an added bonus, it has high levels of omega-3 and omega-6 fatty acids, which makes it healthier than other options. Coconut Oil 450 Degrees Coconut oil has high levels of lauric acid and healthy fats, making it a healthier option for deep frying than other oils. The oil is also odorless and flavorless, which protects the flavor of your chicken and prevents flavor transfer. The temperature of your oil is important when frying chicken, because if the oil is too cool, your chicken will turn out greasy and if it's too hot you'll have a burnt crust with a raw interior. You should fry your chicken between 350 and 375° Fahrenheit and the oil temperature should never fall below 325°. When frying chicken, you should also be sure to check the internal temperature to make sure your fried chicken has reached 165°. Because chicken wings are smaller and have less meat, they will cook faster, so you need to use a different temperature for cooking them as opposed to frying chicken breasts or thighs. You should fry your chicken wings at 375° Fahrenheit so you get a crispy crust but a juicy interior. Pat your chicken with a paper towel before tossing it in your breading to ensure a crispy texture after frying. Bring your chicken to room temperature before breading and frying. If you fry straight from the fridge, your chicken will be too cold, which will reduce the temperature of your oil and result in an uneven fry. Let the chicken rest after you fry it to let excess oil drain away and the crust to get extra crispy. 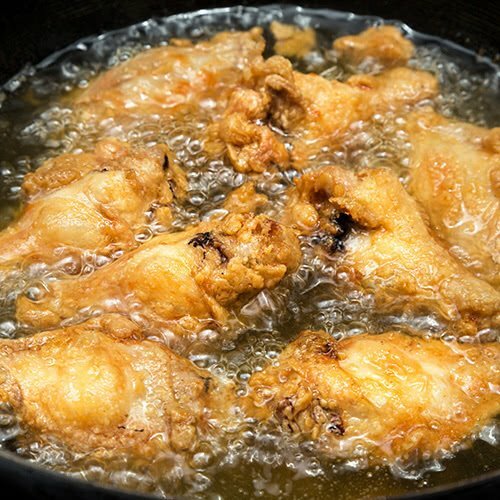 After frying, cool your fried chicken on a wire rack, rather than paper towels, so the oil can drain away. Fried chicken is a crowd-pleasing dish that is perfect at any Southern kitchen, sports bar, buffet, or catered event. While this dish may seem easy to make, small considerations, such as the type of oil for frying the chicken, can have a major impact on the final product. Additionally, keep our tips in mind when frying your chicken to result in a delicious, crisp, and perfectly cooked product. With so many commercial fryer styles and manufacturers to choose from, choosing the best commercial deep fryer can be overwhelming! Whether you own a large restaurant, sports bar, concession stand, or food truck, we have the perfect unit to allow you to fry up your signature entree, appetizer, or side dish with confidence! Read on to learn more about how to choose the fryer that is right for your business.